Homage to Marie Sallé | The New York Baroque Dance Co.
Our concert, Homage to Marie Sallé, included major choreographic works by her and was a huge artistic undertaking by the company. Partially supported by commissions from the Music Festival of Sansoucis in Potsdam, Germany , the work was praised by national and international press. All music, as usual, was played by period instrument orchestras. Excerpts from this concert will be presented at the Hillwood Museum and Garden in Washington D.C., this July 14th and 15th, in honor of Salle’s 300th birthday with music by Opera Lafayette. 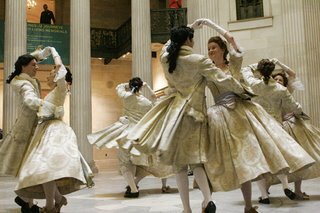 Ongoing projects for the NYBDC include Battlefields and Ballrooms, which creates performance and educational dance programs for historical sites. Our first performance was for the re-opening of Federal Hall in NYC this past October and marked the beginning of an ongoing relationship with Federal Hall and the Conservancy of National Parks of New York Harbor as well as a new presence for the NYBDC in lower Manhattan. The Monteverdi to Mozart Project, funded in part by the National Endowment for the Arts, has documented Invisible Dances and Mozart’s only ballet, Les Petits Riens. The ballets are to be promoted as historical repertoire for mainstream dance companies in the professional and university fields with the aim to include these works in their own repertoire much as a symphony orchestra season includes works of Bach and Mozart alongside later and contemporary composers. Future plans include the Historical Dance Summer Workshop to be held annually at Goucher College . This workshop consists of a weekend intensive exploration of ball and country dances from Shakespeare’s time to Jane Austen’s, as well as a professional studies week for choreographers, dancers and teachers. Great Picture. I wished I had actually known there were dance companies that provided this form before I left, I would of definitely looked into it.